Have you ever wanted to walk on water? Snowshoes let you do that! I have never strapped tennis racquets to my shoes and walked to school in the snow, uphill both ways. But one winter in Alaska, I had a job to do outdoors, and the ATV was in the shop. I spent eight hours walking outside, in three feet of snow. Snowshoes saved my life. The next morning, my calf muscles had some very choice words for me. But by the time the ATV had been returned to me the next week I was a snowshoeing pro, gliding over the snow and enjoying my walks. Have you ever wanted to walk on water? You can! Frozen water, that is. Long ago, people without access to snowmobiles and grocery stores had a problem. They would get hungry in winter, but a hunt through knee-high snow would more likely result in frustration instead of food. Their solution was to follow the example of the snow hare and float on top of the snow. To do that, they took wood, made a circular or triangular frame, created a lattice of hide, and strapped the lattice inside the frame. Such a contraption spread their weight over the snow, compacting the fluff enough to let the person “float” on top of the snow. Modern snowshoes use the same concept, but with lighter materials that do not need to be waterproofed constantly. If you have ever tried to shove your legs through a foot of snow, snowshoeing may be for you. I have used snowshoes while on the job, but for most people, snowshoeing can be a good hobby. Do you like to run? How about hike? 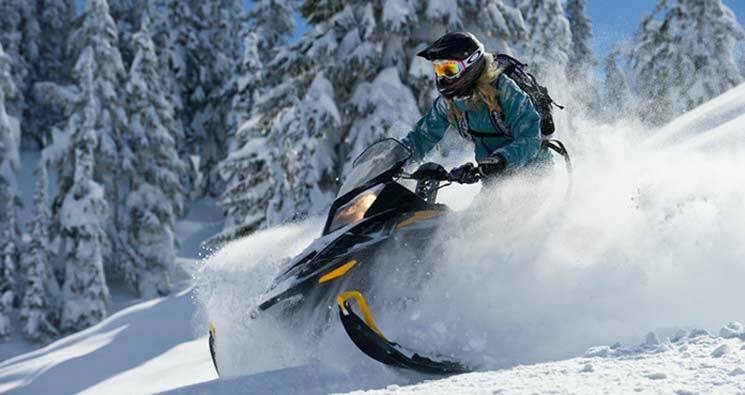 Do you have to abandon these activities when winter dumps a foot of snow on the ground? Not if you know how to snowshoe! 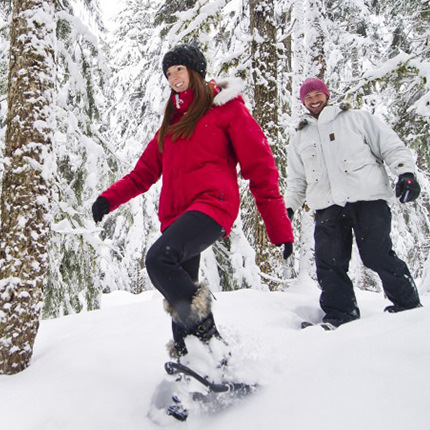 Whether you like relaxation, exploration, or exercising, you should try snowshoeing! 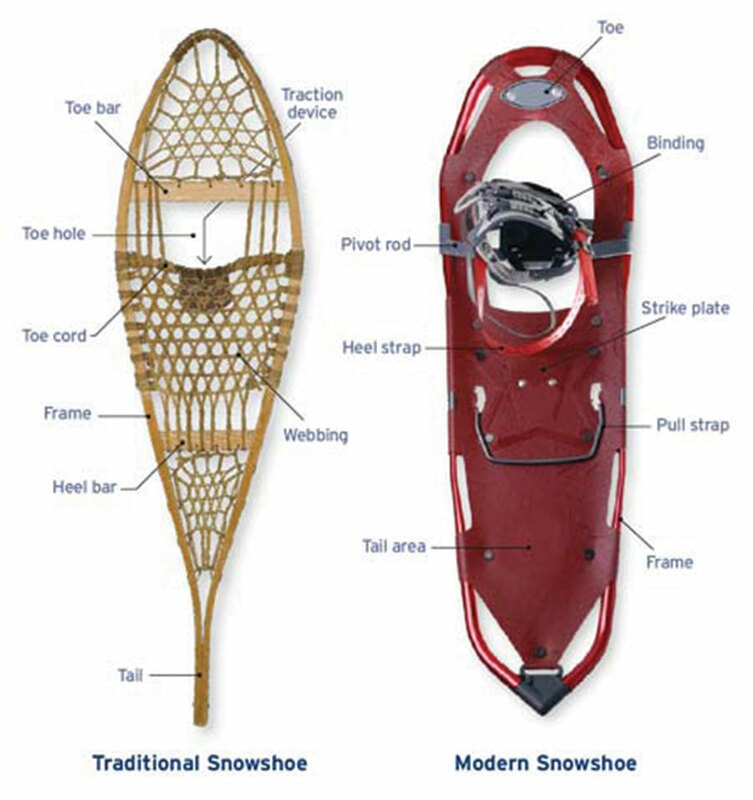 Broadly, snowshoes fall under two categories, traditional and modern. Traditional snowshoes are made of wood and hide, while modern snowshoes are made of anything else. Modern materials require less upkeep, are lighter (and so cause less fatigue), and can handle more abuse. Unless you want to reenact history, a modern snowshoe is recommended. Whether modern or traditional, there are three types of snowshoes: Recreational, aerobic, and mountaineering. Recreational snowshoes are the most common; they are moderately sized and are comfortable to use for about the length of a normal walk. Aerobic snowshoes are small, light, and maneuverable. This makes them good for running (or as close to running in snowshoes can be), but a poor choice for the woods. Mountaineering snowshoes are the largest so they can handle the most varieties of snow, are good for long trips, and often incorporate cleats or other fancy bits to aid in traction. Snowshoeing is physical exertion! This means that you not only have to dress for the outside cold, but also for the sweating and warmth that results from physical activity. Select clothes that protect from the wind and are breathable, so your sweat evaporates. The inner layers should also be of the type of fabric that insulates while wet, such as wool and synthetics. Avoid cotton! It holds water and loses insulation when wet. As for the snowshoes themselves, they are available in many different sizes. Typically, the bigger they are, the more weight they can handle. Most snowshoes are sized in inches. A good rule of thumb is to choose snowshoes that have one square inch of snowshoe surface for every pound you and your gear weight. If snowshoeing on loose powder, an even larger snowshoe than normal is required. Trodding around in snowshoes is a wee bit different from walking down a sidewalk. Your soles are much wider than usual, and snowshoes bind to your foot only at the ball, not the heel. The optimal way to walk is to lift your foot and move it straightforward, sliding the inside edge of that snowshoe over the stationary snowshoe. But that can be a tricky technique to master. When starting out, separate your legs a bit so you are bow-legged. This is more tiring but will keep your snowshoes from hitting each other until you can practice sliding them over each other. Do not walk backward; snowshoes often are curved up in the front but not the back, so walking backward will dig into the snow. Turn around by walking in a circle or execute a kick turn. Keep one snowshoe stationary while lifting the other than plopping it down at a ninety-degree angle, then alternate until you’re facing the direction you need. Without cleats or crampons, snowshoes do not have good traction on hills. Be careful. When walking uphill, treat the hill as if it were a stairway instead of a slope. Lean forward and kick the snowshoes into the snow to make your own steps. Going down is even more difficult. Keep your weight on your heels and make short strides. Turning sideways and descending that way may work as well, but more slowly. Or you can slide downhill, on snowshoes, your bottom, or your face. I recommend the first two. When walking alongside rather than up or down a slope, you need to pay attention to your balance. Lean slightly uphill. Also, twist the uphill edge of the snowshoe into the snow a little bit with each step, swinging your heel into the hill. Poles are not just for skis. You can go for a simple walk on snowshoes without poles, but if you are going to be traveling a hilly or mountainous trail, poles are very helpful. Use them much like how you would use them for skiing. Balance is their number one benefit, but you can also push with them to get a little bit more propulsion. Go slow while learning, and do not commit to a long excursion until your calf muscles have adapted! Keep an eye out for avalanche warnings, know the weather (an ABC watch can alert you to upcoming storms), and do not go out alone. Stick to existing trails unless you are very skilled at mountaineering! Snowshoeing etiquette is very similar to normal hiking etiquette (leave no trace, yield to uphill snowshoers), except for one important difference. Do not snowshoe on ski tracks! Snowshoes create bumps and divots that make skiing on the same trail less pleasant and more dangerous. If you want to enjoy the cold outdoors, but more than eight inches of snow is blocking your way, try snowshoeing! It is a fun, healthy way to explore nature. Evan Michaels is the chief editor at Know Prepare Survive. When he’s not rambling about survival skills and bug out bags, he can be found hiking, fishing, and just generally being a cool dude.